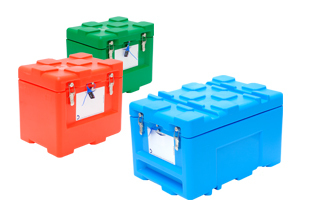 The cubes can be ordered in a range of colours to support your internal flow and processes. For example use red for spare parts, green for tools, blue for ultra clean parts. The lids are equipped with a stainless steel frame with wheels. 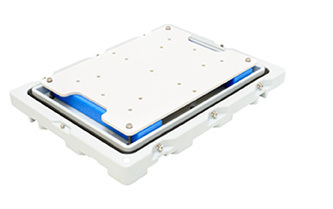 They can be used separately or in combination of two next to each other to move the cubes inside the cleanroom. 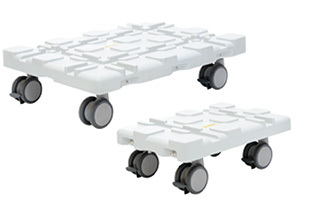 Dollies are available in two sizes: 223 (600 x 400 mm) and 213 (800 X 600 mm) . A push-bar can be mounted on both versions. Developed to handle Cubes in the cleanroom. This push-bar allows to easily move stacked Cubes. The construction can be mounted on both dolly types and can be disassembled for flat transport. 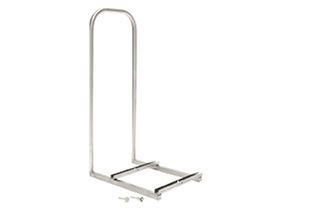 This type of push-bar fits on both types of dollies. Other push-bars can be developed to fit specific needs. Install your parts on a fixed plate on the bottom. This plate can be universal or parts specific and is made of plastic or stainless steel. Foam or Fluor elastomers are used if cushioning is needed. 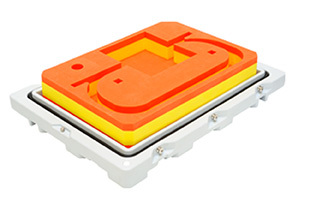 A wide range of inserts are available for the cubes and they can be designed to fit specific products or toolsets. These vary from milled foam to thermoformed trays. Inserts can also be used in combination with the standard pillow concept.